Americans overwhelmingly support direct talks between the United States and North Korea over its nuclear program. About seven-in-ten (71%) approve of these talks, while just 21% disapprove. However, the public is skeptical about whether North Korea’s leaders are serious about addressing concerns over its nuclear program. Overall, 49% say North Korea’s leadership is not serious about addressing international concerns over the country’s nuclear enrichment program, while 38% think North Korea’s leaders are serious about addressing these concerns. At a time of deep partisan divisions over many issues, foreign and domestic, nearly equal shares in both parties – 50% of Republicans and 49% of Democrats – say they think North Korea’s leadership is not serious about addressing nuclear concerns. The latest national survey by Pew Research Center, conducted April 25-May 1 among 1,503 adults, also includes public attitudes about U.S. global involvement, Russia and China. Changing views on whether U.S. does too much – or too little – globally. Americans are now evenly split over whether the U.S. does too little (33%), too much (30%) or the right amount (29%) to solve world problems; that is a change from two years ago, when the plurality view (41%) was that the U.S. did too much globally. The shift has been driven by changes among partisans: Republicans and Republican-leaning independents increasingly say the U.S. is doing the right amount globally, while Democrats and Democratic leaners increasingly think the U.S. is doing too little to solve world problems. More continue to see Russia as a “serious problem” than an “adversary.” There has been little overall change in views of Russia over the past year: 28% regard Russia as an adversary; 42% say it is a serious problem but not an adversary; and 24% say Russia is not much of a problem. While majorities in both parties view Russia as either an adversary or a serious problem, more Republicans (33%) than Democrats (17%) say Russia is not much of a problem. China viewed less negatively by young people. 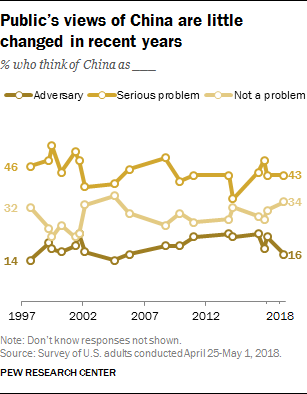 Overall, 16% of the public says China is an adversary; 43% say it a serious problem but not an adversary; and 34% say it is not much of a problem. Adults younger than 50 are twice as likely as those 50 and older to say that China is not much of a problem (44% vs. 22%). A substantial majority of Americans (71%) approve of the U.S. negotiating directly with North Korea over its nuclear program, while just 21% say they disapprove. 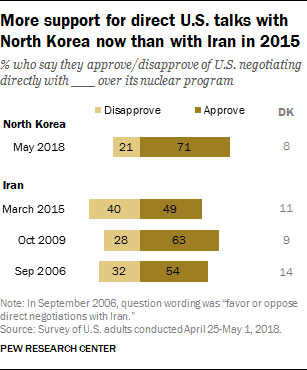 About seven-in-ten Americans approve of direct talks with North Korea today; in March of 2015, shortly before the Iran agreement was reached, only about half of the public (49%) supported negotiating directly with Iran over its nuclear program. A larger share (63%) supported direct U.S. talks with Iran in 2009. 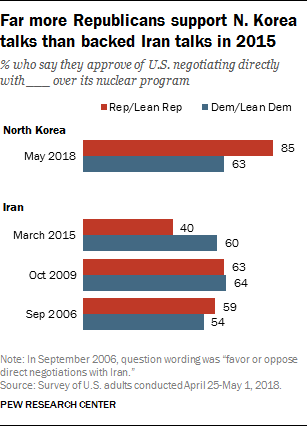 Republicans are significantly more supportive of direct negotiations with North Korea today than they were of negotiations with Iran in the lead-up to the 2015 nuclear agreement. More than eight-in-ten Republicans and Republican-leaning independents (85%) approve of the U.S. negotiating with North Korea. By contrast, only about half as many Republicans (40%) approved of the U.S. directly negotiating with Iran three years ago. In both 2009, Obama’s first year as president, and in 2006, during George W. Bush’s presidency, majorities of Republicans approved of direct talks with Iran. About six-in-ten Democrats and Democratic leaners (63%) currently approve of talks with North Korea. This is roughly the same share that approved of talks with Iran in the fall of 2009 (64%) and spring of 2015 (60%). While there is widespread public approval of U.S. negotiations with North Korea, nearly half of Americans (49%) say North Korea’s leadership is not serious about addressing international concerns about their country’s nuclear enrichment program. Fewer (38%) say North Korea is serious about addressing these concerns. Views of whether North Korea is serious about addressing concerns over its nuclear program are similar among Republicans and Democrats. 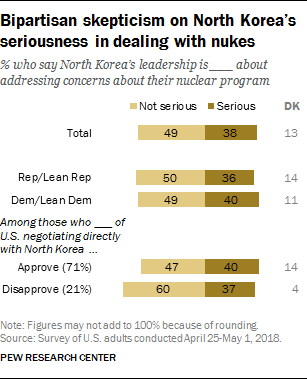 About half in both parties (50% of Republicans and 49% of Democrats) say they are not serious, while 36% of Republicans and 40% of Democrats say North Korean leaders are serious. 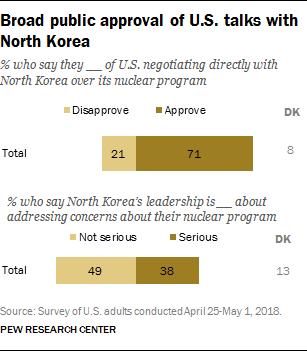 And while a majority (60%) of those who disapprove of direct U.S.-North Korea talks say North Korea’s leaders are not serious about addressing nuclear concerns, so too do nearly half of those who approve of direct U.S. talks with North Korea (47%). 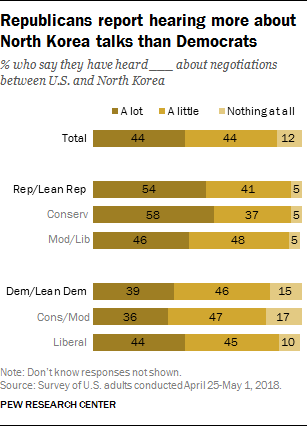 More than four-in-ten Americans (44%) say they have heard “a lot” about negotiations between the U.S. and North Korea, while an additional 44% have heard a little; just 12% have heard nothing at all about the talks. By contrast, public awareness of the 2015 Iran deal in this survey was much more modest: Just 27% said they have heard a lot about the 2015 Iran nuclear agreement, 46% a little, and 26% nothing at all. (Note: This survey was conducted before President Trump’s May 8 announcement that the U.S. would withdraw from the Iran deal). The negotiations between the U.S. and North Korea are resonating more among Republicans than Democrats. More than half (54%) of Republicans and Republican-leaning independents say they have heard a lot about the U.S.-North Korea talks, compared with 39% of Democrats and Democratic leaners. Public assessments of the United States’ global role have shifted over the last two years, as views among Republicans and Democrats have moved in sharply different directions following the change in presidential administrations. 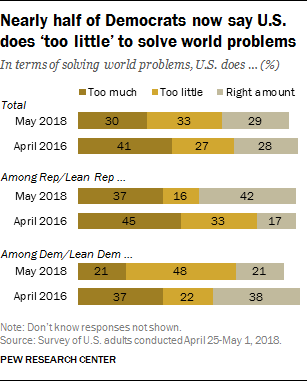 Overall, the public has mixed views about U.S. efforts to solve world problems: About equal shares say U.S. does too little (33%), too much (30%) and about the right amount (29%) in helping to solve world problems. Current views mark a shift from April 2016. Two years ago, a 41% plurality said the U.S. did too much to solve global problems; fewer said the country did too little (27%) or about the right amount (28%). Among Democrats and Democratic leaners, nearly half (48%) say the U.S. does too little to solve world problems, up from just 22% two years ago. There has been a 16-percentage-point decline in the share of Democrats who say the U.S. does too much to help solve world problems, and a 17-point decline in the share saying it does about the right amount. Over the same period, the share of Republicans and Republican leaners who say the U.S. does the right amount to solve world problems has more than doubled (42% now, 17% then). However, nearly four-in-ten Republicans (37%) say the U.S. does too much to solve world problems, down from 45% in 2o16. The share of Republicans who say the U.S. does too little in this regard has fallen 17 percentage points (from 33% to 16%). The public also is divided in assessments of the country’s role as a global leader today versus 10 years ago. 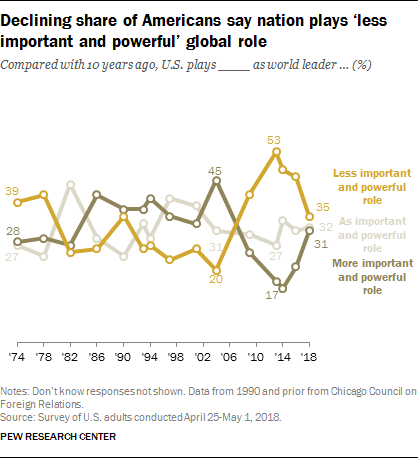 Overall, 35% say the U.S. plays a less important and powerful role as a world leader today than it did 10 years ago; roughly as many say it plays about as important a role (32%) or a more important role (31%) than a decade ago. While divided in their overall views, the public sees a more prominent role for the U.S. today than it did a few years ago. In 2016, 46% said the U.S. played a less important and powerful role as a world leader than it did 10 years prior; smaller shares said its global role was as important (31%) or more important (21%) than it was a decade before. Republicans have become much more likely to say the U.S. plays a more important role as a world leader today than in the past. Overall, 45% say the United States’ global role is more important today than it was a decade ago; in 2016, just 15% of Republicans said this. This shift has been accompanied by a sharp decline in the share of Republicans who think the country’s global role is less important than a decade ago; just 19% say this today, compared with 65% who said this in 2016. Views among Democrats have moved in the opposite direction. Nearly half (49%) think the U.S. plays a less important leadership role today than it did 10 years ago, up from 29% who said this in 2016. 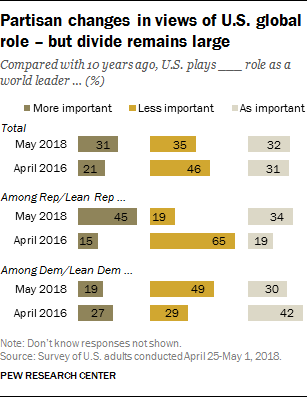 Three-in-ten Democrats say the U.S. global leadership role is about as important as it was 10 years ago and 19% think it is more important; both shares are somewhat lower than they were in 2016. About four-in-ten Americans (42%) say they think of Russia as a serious problem, but not an adversary; fewer (28%) consider Russia an adversary and 24% say the country is not much of a problem. Overall public views are about the same as there were in January 2017, shortly before Donald Trump took office. As was the case then, about twice as many Republicans (33%) as Democrats (17%) say Russia is “not much of a problem.” However, somewhat fewer Democrats view Russia as an adversary than did so in January 2017 (30% now, 38% then), though the share describing it as either a serious problem or an adversary is little changed. Republicans’ views of Russia have changed little over this period. The public sees China in less negative terms than Russia. Still, 43% consider China a serious problem (but not an adversary); about a third (34%) say China is not much of a problem, while just 16% consider China an adversary. The share that considers China an adversary has edged down 6 points since early 2017. Adults younger than 50 are less likely than older adults to see China as a problem. Nearly seven-in-ten (68%) of those ages 50 and older view China as a serious problem (49%) or as an adversary (19%). 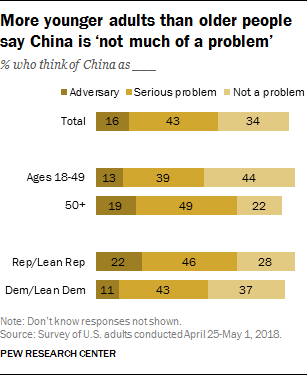 A smaller share of those ages 18 to 49 (51%) think of China as a serious problem (39%) or as an adversary (13%); 44% of younger adults consider China not much of a problem. Among Republicans and Republican leaners, 68% say China is a serious problem (46%) or an adversary (22%). A smaller majority of Democrats and Democratic leaners see China in these terms (54%), including just 11% who think of China as an adversary.